How to manage punch settings and set restrictions. You will need to have permissions to access this page and usually all account admins will have access by default. Note that the punch settings are per site. This means that you will have the same settings for each site. To change the site, select your site from the dropdown in the top right. 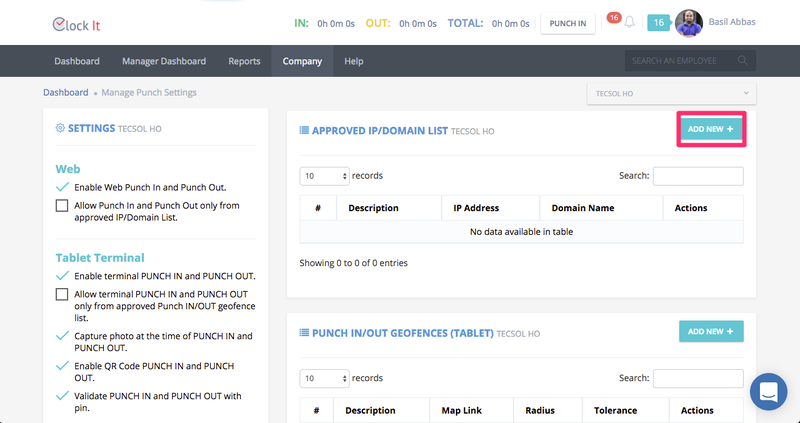 The left hand column will have all the punch settings and the right side contains the approved IP/Domain and Geo Fences. Enable or disable the web punch for your site. If enabled you will be able to see the PUNCH IN and PUNCH OUT buttons on the top of each page. 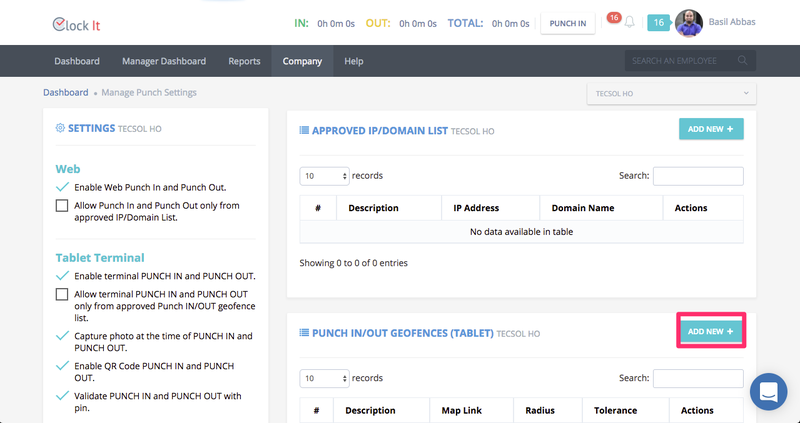 Allow Punch IN and Punch OUT only from approved IP/Domain List. This setting will check if the web punch is coming from a lit of approved IP addresses or domain. 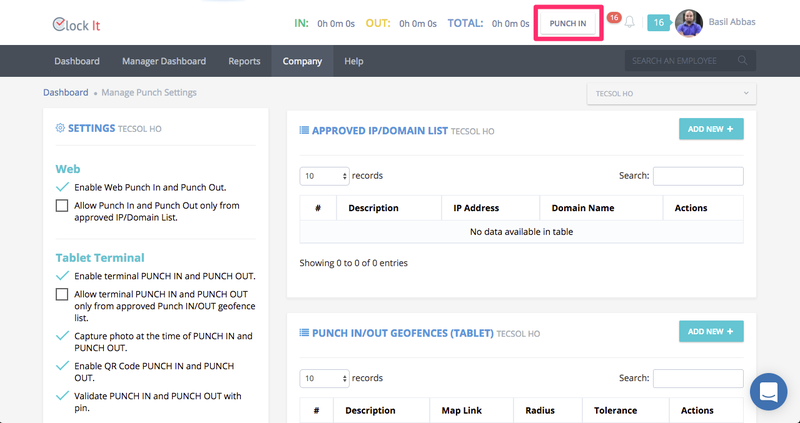 You can also whitelist IP’s or domains where the Punch button should be visible from. The domain feature is particularly useful when you have a dynamic IP. You can simply enter your DDNS domain and ClockIt will work just fine. 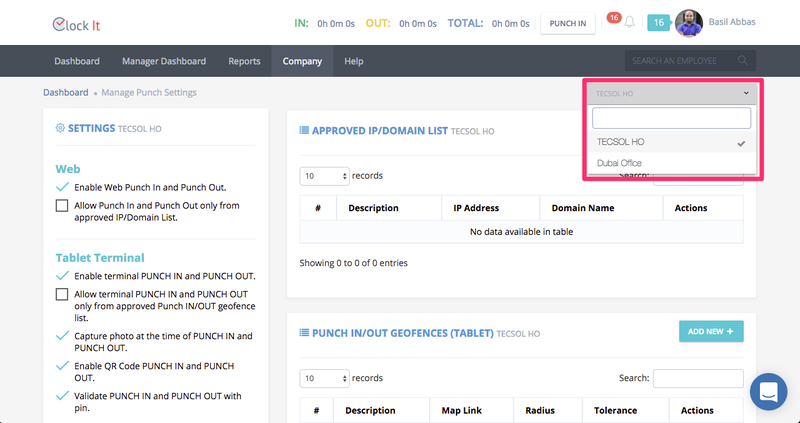 To whitelist an IP/Domain, ensure the second setting is enabled and click on the Add New button. Enter your IP/Domain and give a short description for future reference and click save. If you use a domain, ClockIt will resolve all domains every 60 seconds. This means that your IP has changed, you will need to wait for at least 60 seconds before the changes will be visible on ClockIt. If you do not see the changes applied immediately, refresh your page or log out and log back in. Your browser might be retrieving your pages from cache. 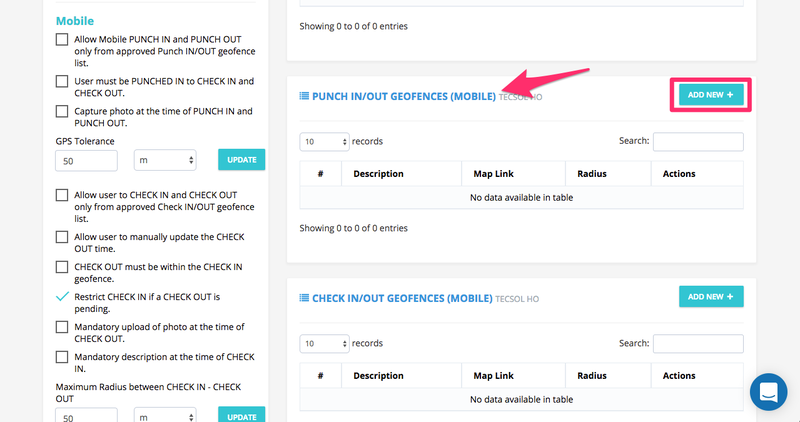 Allow Mobile PUNCH IN and PUNCH OUT only from approved Punch IN/OUT geofence list. Use this setting to allow users to punch only from approved locations. 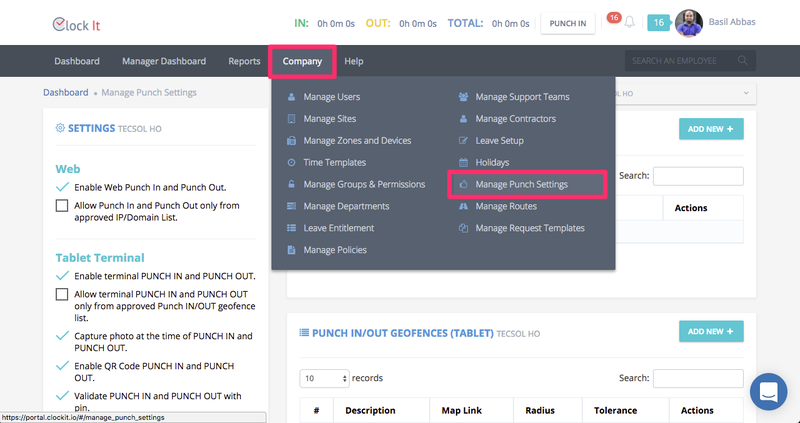 For example, you can set your office location as the punch location so that users will not be able to punch outside of this location and the set radius. Enter the details as shown in the form. If you are unsure about the latitude and longitude, you can pick one form the google map search or drop a pin into the map. NOTE: If you use the search ClockIt will only drop a search pin on the map. You will need to create a location by clicking on the is Google Pin to activate your location. Specify the maximum radius that the user should be within to punch along with your uint of meters or miles. Click Save once done. This setting will ensure that employees that use the mobile app are allowed to punch IN and OUT only from the approved IP or domain. User must be PUNCHED IN to CHECK IN and CHECK OUT. This setting will ensure the the user must be punched IN to create a CHECKIN. If this option is not enabled, the use can use the app to create CHECKINS. Note that the CHECKINS do not contribute to the work duration, but rather the PUNCH time is used for the work duration calculations. Capture photo at the time of PUNCH IN and PUNCH OUT. Use this setting if you want photos to be captured at the time of PUNCH IN and PUNCH out. You can see these captured photos in the user profile under the Today View. Capture location at the time of PUNCH IN and PUNCH OUT. This setting is used if you want to disable location capture for clock in clock out. This setting will tell ClockIt what is an acceptable GPS tolerance. The GPS tolerance is nothing but the GPS signal strength on the mobile phone. While indoors the tolerance is HIGH an can cause the location to be inaccurate. By setting this parameter low you are ensuring that your users have an optimal GPS signal before thy punch or checkin. 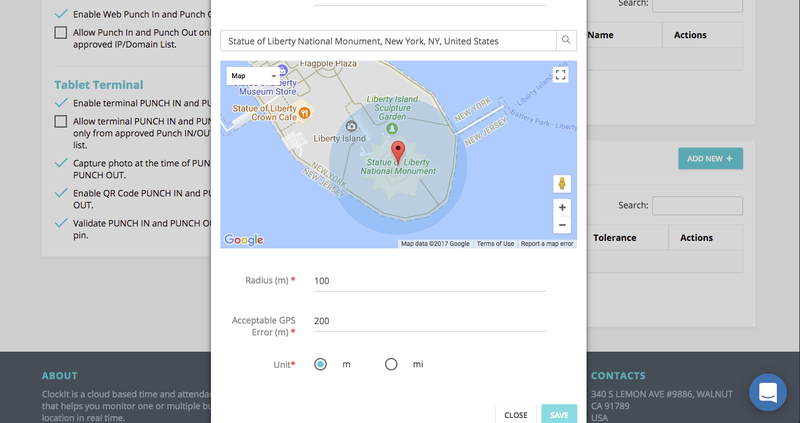 Allow user to CHECK IN and CHECK OUT only from approved Check IN/OUT geofence list. This setting is very similar to the punch geofence settings but will be used for checkins. For example you may have 5 locations that the user must periodically visit and much checkin only from those locations. This settings will allow you to geofence your checkins. Allow user to manually update the CHECK OUT time. This setting will allow the user the modify the checkout time from within the mobile app. ClockIt supports calculations of CHECKIN/CHECKOUT duration and you can give the option to users to change the checkout time if they wish. CHECK OUT must be within the CHECK IN geofence. This setting will ensure that users CHECKOUT only from where they have CHECKED IN. You must specify what is the accepted radius for this setting. Restrict CHECK IN if a CHECK OUT is pending. Block future CHECKINS if the previous location is not CHECKED OUT from. This will ensure that your users always CHECK IN and OUT as per your company policy. Mandatory upload of photo at the time of CHECK OUT. This setting will force the user to upload photos of a checked in location at the time of CHECKOUT. Mandatory description at the time of CHECK IN. This setting will ensure that a description is collected at the time of CHECKIN. 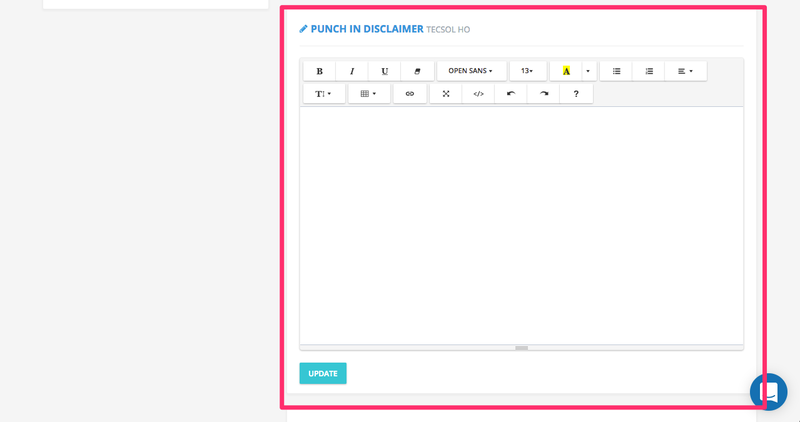 You can have disclaimers setup every time a user punches IN and OUT. Unless the user agrees to this, the punch will not be captured. The Terms and Conditions can also be viewed by the user in the mobile browser at the time of punching. Add your disclaimer to the editors below. You can have a separate disclaimer for PUNCH IN and PUNCH OUT. Enable terminal PUNCH IN and PUNCH OUT. This setting is used to enable the Kiosk app. If disabled the user will not be able to login into the Kiosk. Allow terminal PUNCH IN and PUNCH OUT only from approved Punch IN/OUT geofence list. This setting will accept punches from the Kiosk only if the location is within the acceptable range and tolerance of the set Geo Fence. This setting ensures that the Kiosk captures a photo every time a user punches IN and OUT. All captured photos can be seen in the Today View of the employee. Enable QR Code PUNCH IN and PUNCH OUT. Enable the Kiosk app to scan QR codes. Validate PUNCH IN and PUNCH OUT with pin. Use this setting if you have a tablet that has only camera. By default the ClockIt kiosk will use the front camera. If you find that your tablet is giving you a black screen for photo capture, you can toggle these settings. Adding Geofences for your Kiosk. 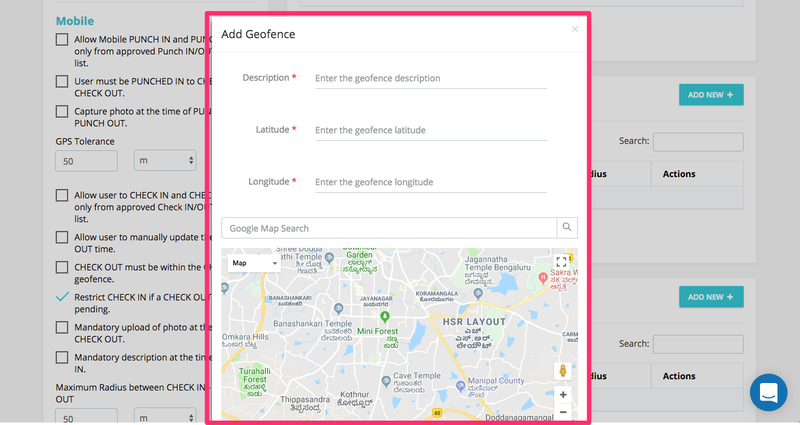 Enter a description to identify your Geo Fence. Enter your Lat/Long if you know it or use the Google Map to pick out a location. You can also use the search to find a location. Note: The search will only drop a PIN on the searched keyword. You will need to still drop your PIN once the search is completed. Set the radius within which the iPad app can operate. You can also see the radius on the map. Default of 100 is a good setting to start with. You can change this later and fine tune it as per your needs at any time. Set Acceptable GPS Error. This setting is the maximum error that the Kiosk GPS can have. The iPad may not be able to get your accurate location always. There can be an error and this setting specifies the maximum error rate. A default setting of 200 is a good place to start and you can fine tune this later also. Set your units meters or miles.